In a large saucepan (where you will make the broth) heat a bit of oil (1-2 tablespoons). Blend the “reserve” ingredients and fry in the saucepan. Add the broth (or dilute 3 vegetable or chicken cubes in 3L hot water), let boil. 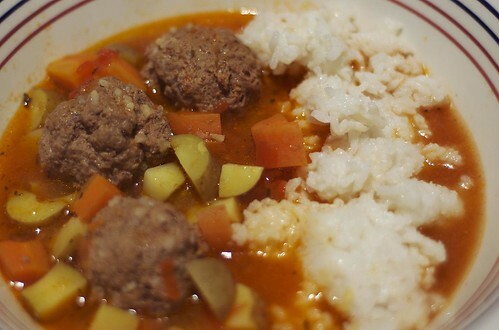 When it starts to boil, add the meatballs and dispose of the froth that forms. When it starts to boil again, add the vegetables: potatoes in large chunks and carrots in 4 small sections. Add the courgette a few minutes later (since it’s softer, it cooks faster). When the potato is soft, all the vegetables will have finished cooking. Season to taste with salt and pepper, add a head of coriander. 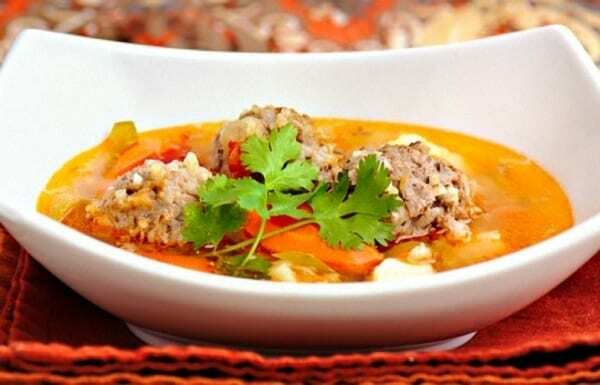 This soup is usually paired with “arroz rojo”. Serve whilst hot, provecho!